Finches have been identified as part of a created kind that has diversified considerably since the Flood of Noah’s time.1 They are well known for their variation in beak size and shape. These differences in beak morphology between various species of finches are associated with differences in diet. It appears that these differences have played an important role in allowing birds to fill numerous ecological niches around the world. One issue to address is the source of variation. Is it really random, as is commonly believed, or were creatures designed to be able to vary? Beaks can vary in three dimensions: length, width, and depth. The morphology of the beak in an individual adult is determined during its development. Research on Darwin’s finches is revealing molecular mechanisms that account for these differences in development. Two distinct developmental phases are responsible for determining adult beak shape. The details are fascinating and contradict the assertion that variation is random. Rather, they reveal a purposeful design. Six different species of Darwin’s finches (Geospiza) were compared and it was discovered that expression of Bmp4, a gene that plays important roles during development, was correlated with depth and width in finch beaks.2 The time, place, and level of expression were all found to be important. The sharp beaked finch (G. difficilis) has a small symmetrical beak that appears to be relatively unspecialized; it was used as the reference species. In this species Bmp4 expression is first detected in the area of prenasal cartilage formation at embryonic stage 26. By stage 29, the cartilage is apparent and expression continues in a limited area surrounding it. Ground finches have deeper, wider beaks. In the species with the greatest width and depth (G. magnirostris), elevated Bmp4 expression was detected by stage 26. In the other two species of ground finch, elevated expression was detected, but not until stage 29. The last two species, both cactus finches, had more pointed beaks and did not show the relative increase in the expression of Bmp4. Were creatures designed to be able to vary? The scientists ran several other tests to confirm that Bmp4 is actually responsible for the differences in beak depth and width. The results highlight the importance of where in the embryo the increased expression of this gene takes place. When they artificially increased the level of expression in a chicken embryo at the appropriate stage of development, the results depended on where the increase occurred. When it was in the mesenchyme region where the prenasal cartilage forms, it caused a deeper, wider beak, as is characteristic of ground finches. When the increased expression was in the nearby facial epithelium, the beaks were narrower and smaller. Thus, time, place, and degree of gene expression are all critical factors affecting final beak morphology. A separate study found that increased calmodulin expression is correlated with greater beak length.3 Calmodulin is a ubiquitous calcium-binding protein involved in a variety of calcium-dependent cell functions. An elongated beak enables cactus finches to probe flowers for food. Again using local upregulation in a chick embryo’s mesenchyme the researchers were able to show that it resulted in a longer beak. So, beak length is regulated separately from depth and width during this stage of development. It is apparent that differences in beak shape can result from shifts in gene expression during the complicated development process. 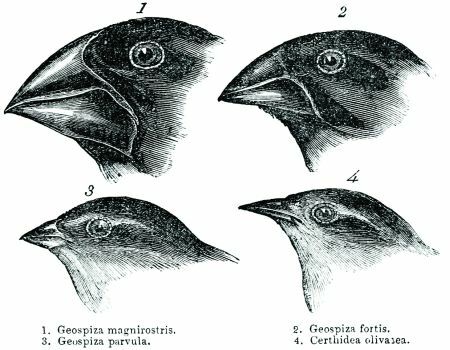 So the next question is how does a particular beak shape become characteristic of an interbreeding population (species) of finches? The standard answer is natural selection. But how can nature select if it has no mind? It cannot. 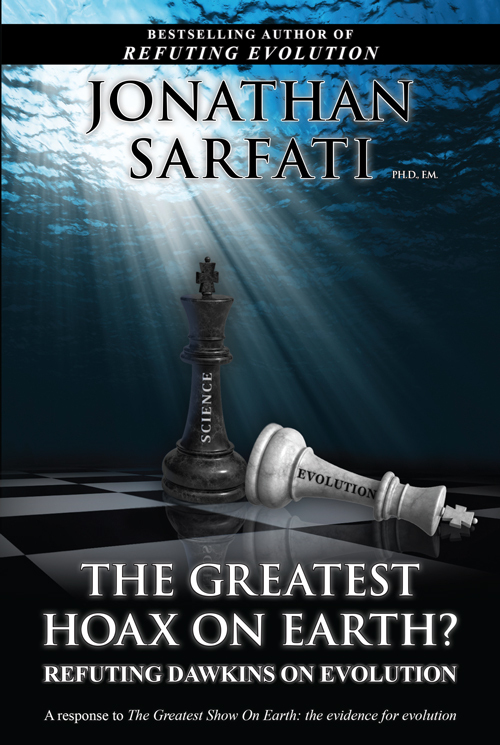 However, the term is used by biologists to describe a potentially valid biological concept. It is possible that certain individuals in a population have traits that are advantageous and allow them to be more successful at surviving and producing offspring. Others may have traits which hinder their survival and/or their ability to produce offspring in a given environment. Since those with the advantageous traits should leave more offspring for the next generation, those traits should become more common in the population. One example in finches that seems to fit this concept involves the disappearance of many adult birds from a medium ground finch (G. fortis) population following periods of drought.7 A high adult mortality was recorded, which appeared to be from the loss of a previously abundant food source. The remaining birds tended to be larger and better able to exploit the remaining food source. While the explanation seems plausible enough, other factors may be involved. The most obvious is bird behaviour. If some individuals find an environment unsuitable, what would stop them from migrating? In this case they could still have offspring, but they would be living elsewhere. In a similar way, if a new niche became available, it might be invaded by relatively few individuals that had traits that fit well with the niche. In this case the high proportion of those traits is not from less fit individuals dying off early as much as it is from adapted individuals moving in and founding a population in that area.8 So both migration and the founder effect are also plausible explanations for the observation that some traits, like beak shape, have become characteristic of different populations. There is evidence that bird behaviour has been involved in shifts in the traits of Darwin’s finches. After the severe drought, hybridization between medium ground finches (G. fortis) and common cactus finches (G. scandens) appears to have restored some of the variability in beak size that had been lost during the harsh drought conditions.9 This was helpful as some previous food sources became available again after the rains returned. In addition to the behaviour of the birds affecting the pattern of traits in a population, there could also be genetic or epigenetic factors which affect them (e.g. gene conversion, heritable epigenetic changes, phenotypic plasticity). Environmental factors could signal common traits to undergo rapid readjustment, as seen in captive foxes, even after generations of stable traits.10 So, while ‘natural selection’ may have played a role in some cases, it is important not to glibly attribute all shifts in traits to it. Doing so obscures what is really going on. Which way does the beak point? It is fascinating to learn about a portion of the complex developmental pathways that are involved in developing bird beaks. These well-designed networks are impressive as they coordinate the development of the beak in a way that the components properly fit so the beak is functional. Even more impressively, the design does not result in a ‘one-size-fits-all’ beak, but provides for adjustments so the beak can be useful in a wide variety of habitats. Two dimensions can be changed in concert with each other (such as width and depth in the first stage) or independently. Not only must the beak be able to form, but it must be properly integrated with the rest of the body so as to be functional. Though these findings were interpreted within an evolutionary worldview, they don’t support the conjecture that beaked finches evolved from a beakless ancestor. Certainly there is evidence that the birds have adapted to different niches because the shape of the beak can vary between individuals. Changing the final beak shape requires that all the information for beak formation already be in place. Not only must the beak be able to form, but it must be properly integrated with the rest of the body so as to be functional. All this suggests considerable planning and foresight was involved in the design of beak formation in birds. The evidence fits very well in the creation model. Both birds and sea creatures were created on Day 5. Then, God blessed them and said, “Be fruitful and increase in number and fill the water in the seas, and let the birds increase on the earth” (Genesis 1:22 NIV). 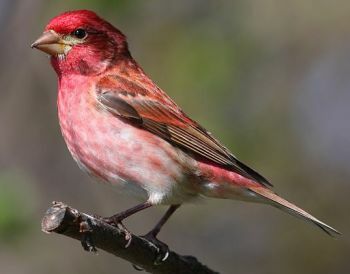 In learning about beak development we catch a glimpse of one way God has provided for birds so the earth can be inhabited (Isaiah 45:18). The harsh realities of death are recognized as effects of the Fall (Genesis 3; Romans 8:19–22). Yet in the midst of this, God still provides. He gives birds wisdom so they can survive (Job 35:11), which is evidenced by their behaviour in finding food sources and a mate. There are certainly many ways God has provided for them that we have yet to learn as we continue to study them. What an awesome Creator we have! Lightner, J.K., Identification of a large sparrow-finch monobaramin in perching birds (Aves: Passeriformes), J. Creation 24(3):117–121, 2010. Return to text. Abzhanov, A., Protas, M., Grant, B.R., Grant, P.R. and Tabin, C.J., Bmp4 and morphological variation of beaks in Darwin’s finches, Science 305(5689):1462–1465, 2004. Return to text. Abzhanov, A., Kuo, W.P., Hartmann, C., Grant, B.R., Grant, P.R. and Tabin C.J., The calmodulin pathway and evolution of elongated beak morphology in Darwin’s finches, Nature 442(7102):563–567, 2006. Return to text. Though often bone is formed on a cartilage template, these two development phases seem to be independent in this portion of craniofacial development. Mallarino, R., Grant, P.R., Grant B.R., Herrel, A., Kuo, W.P. and Abzhanov, A., Two developmental modules establish 3D beak-shape variation in Darwin’s finches, PNAS 108(10):4057–4062, 2011. Return to text. In ground finches there was expression in a broader area within the mesenchyme compared to that of cactus finches. In the large ground finch, expression also appeared earlier. Return to text. Darwin, C., Journal of researches into the natural history and geology of the countries visited during the voyage of H.M.S. Beagle round the world, under the Command of Capt. Fitz Roy, R.N., 2nd ed., 1845. Return to text. Price, T.D., Grant P.R., Gibbs, H.L., and Boag, P.T., Recurrent patterns of natural selection in a population of Darwin’s finches, Nature 309(5971):787–789, 1984. Return to text. 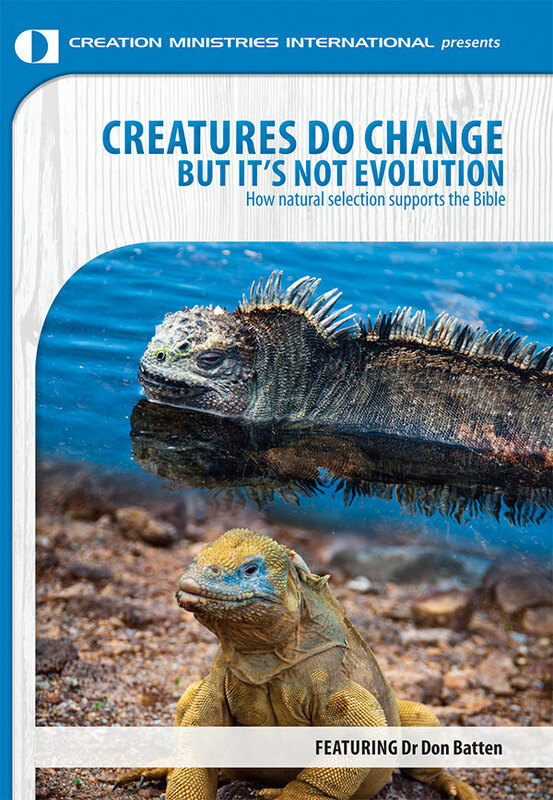 Guliuzza, R., Darwin’s sacred imposter: How natural selection is given credit for design in nature, Acts & Facts 40(7):12–15, 2011. Return to text. Grant, B.R. and Grant, P.R., High survival of Darwin’s finch hybrids: effects of beak morphology and diets. Ecology 77(2): 500–509, 1996; Grant, P.R., Grant, B.R., Keller, L.F., Markert, J.A. and Petren, K., Inbreeding and interbreeding in Darwin’s finches, Evolution 57(12):2911–2916, 2003. Return to text. Lightner, J.K., Selection for a behaviour, and the phenotypic traits that follow, J. 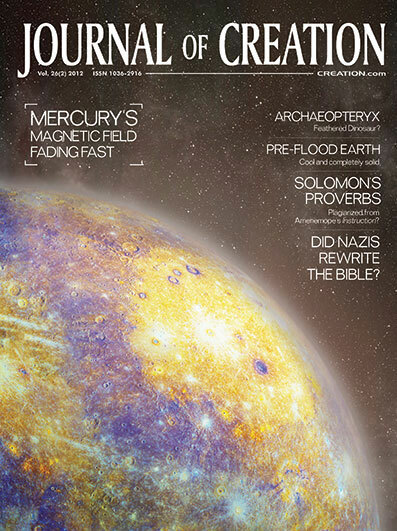 Creation 25(3):96–101, 2012; Thomas, B., On the origin of dogs, Acts & Facts 41(1):16, 2011. Return to text.